I enjoy seeing the hummingbirds buzzing around in my garden. They love the deep pink azaleas in May. Even though I don't have hummingbird feeders out, they seem to find flowers they like all summer long. 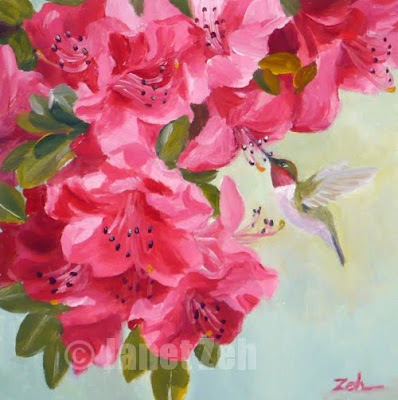 In this painting, I've painted a ruby throat enjoying the blossoms. The oils were wonderful for painting these rose pink azaleas. Yes, oils are lovely to work with! The brushstrokes are the beauty of oils along with the rich colors. If I recall correctly, you are an oil painter yourself, aren't you?